So Christmas has been and gone already. And what a fabulous Christmas it was too. A little different for me as my parents spent the holidays over in Australia with my sister and so it was just me, Coop and Squitchy. I have to admit, I was a little bothered about having a Christmas on our own. Without the family, and the food and games that come along with them, how would it be different to any other day? I needn't have worried. Christmas was a lovely relaxed day which is just what I needed as I worked until late on Christmas eve. Lots of presents, lots of food and lots of time spent together. Perfect. This super relaxed Christmas has also given me some time to catch up on a little crochet. Fresh Stitches crochet specifically. Coop bought me a cute Cath Kidson bag for Christmas and tucked inside was a rainbow of yarns; I was very excited (and impressed, he picked them all by himself - with a little help from Paul the wool man - and they are just what I would have chosen had I been there). 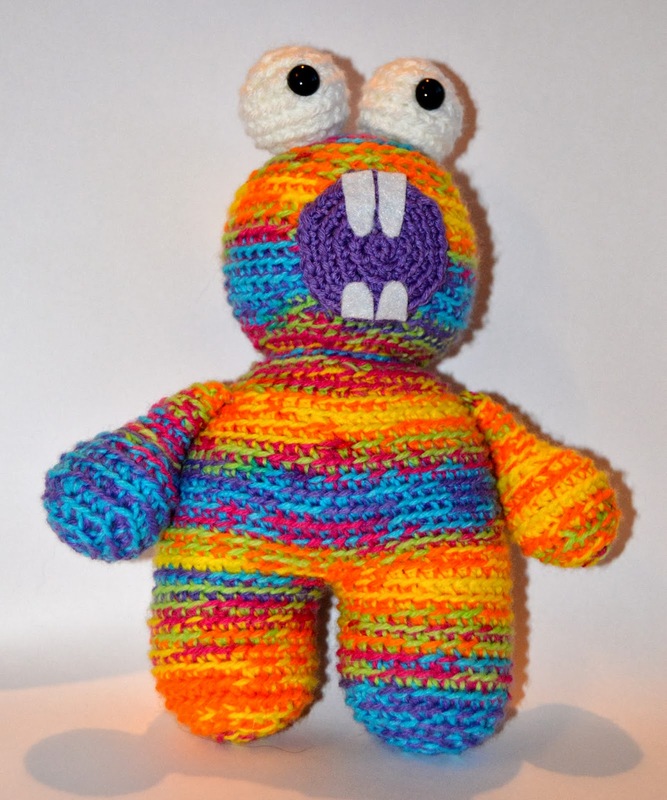 So once the cooking was finished and we couldn't fit anymore sweets or chocolate in, I picked up my hook and set about making this multicoloured monster from a Fresh Stitches free pattern here. Doesn't he look great in rainbow stripes? I also finished off my Fresh Stitches Gingerbread Man who I think is one of the cutest little things I have made. I just love his smiley little face. Now those amongst you who are particularly eagle-eyed may notice that his right arm is slightly shorter than his left. The gingerbread man was my plane project when I flew to Chicago. Unfortunately, I flew on the day that all air traffic control was down in the UK and so had a rather long wait on the tarmac for the plane to take off. 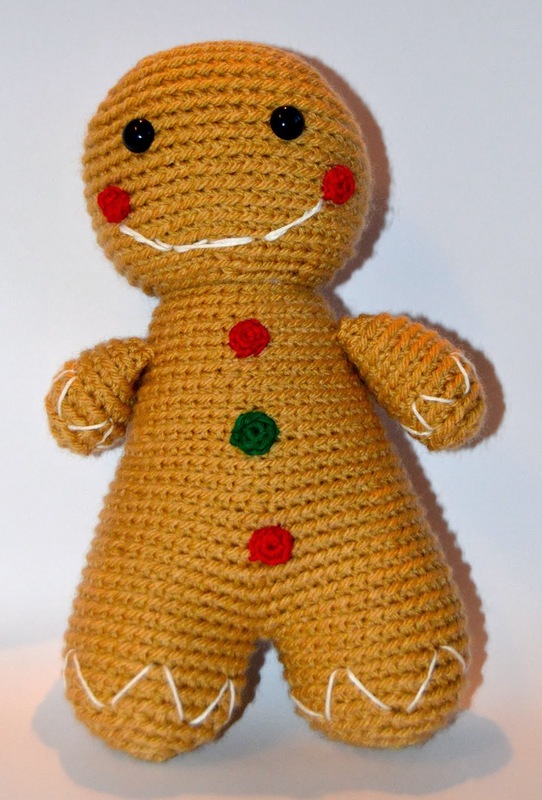 The gingerbread man was finished rather swiftly, but I ran out of yarn with around two rows to go on his last arm! Rather than wait until I got home and risk him unravelling, I decided that this quirk would add to his overall charm, and I am so very happy with how he turned out! I hope you have all had an enjoyable relaxing Christmas spent with the people you love. 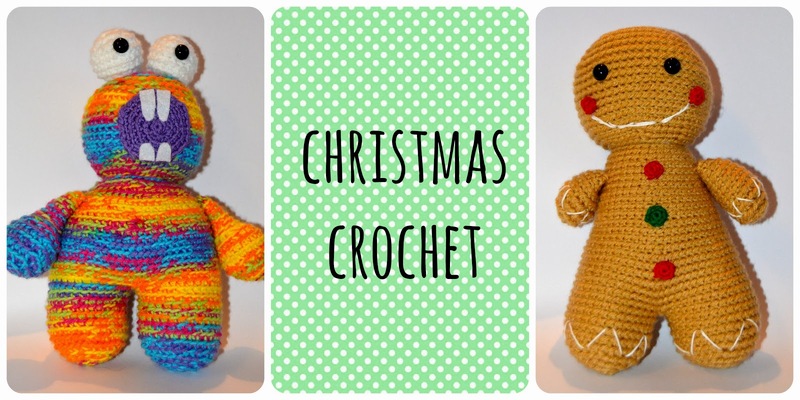 Did you get any crochet gifts this year? 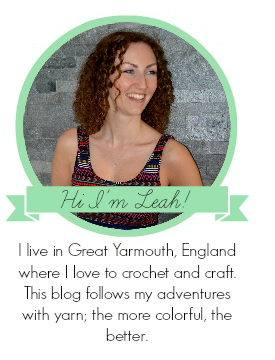 And most importantly, dud you manage to sneak in a little crochet time over the holidays? !